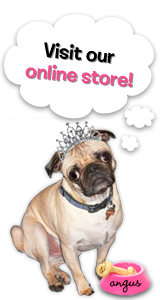 The Rubber Cafe Design Team Blog: For the Dogs! Hi There ~ Kendra here today with a quick little project that is perfect to congratulate a new pet owner. For my card, I stamped the It's A Dog's Life image once on rustic cream cardstock and then again on kraft cardstock with Memento Rich Cocoa Ink. Using a circle punch, I cut out the paw print in the center on both colors of cardstock and interchanged them for the tag and the card so the images would pop a bit. A little bone shapped paper clip finished my super clean and simple card. I used Spellbinders Circle & scallop dies to trim the tag & then added some twine & ribbon to the bag of doggie treats for the lucky pup! Kendra, this is so doggone (haha) cute!! !